It was 1973-1974, and my family was on a day trip to Munich, in Bavaria, just down the road from Nuremburg. And where did military families go, when they visited the very fine city of Munich? To the Post Exchange, of course! Oh, and we also went to the town square and watched a particularly energetic cuckoo clock, but that's a story for another time. The PX was several floors of awesomely awesome...stuff. There was stuff as far as my eight year old eyes could see. I didn't even know what half of the stuff was, but it was stuff that I did not have, and it was glorious. My brother and I were kids in a candy store...literally, because the PX had aisles of candy, too! We immediately began to drive my parents crazy with the whining and the begging and the pleading over every single thing our little eyes could focus on. Because, stuff. My parents, thinking that there couldn't be a single thing in that part of the store that we would want, directed us through the record section. And that is where we found it. I was 8. My brother was 5. We had ZERO idea who Elton John was, but that was absolutely the coolest album cover that either of us had ever seen, and we wanted it. And my father, who denies the existence of all but Conway Twitty and Elvis, gave in to our request, just so he and my mom could have some peace and quiet on the drive back to Nuremburg. My brother and I shared one of those portable record players where the music comes out all tinny and shrill. I hogged that record player often, because I had Donny Osmond albums. But Donny was relegated to the bottom of the collection for Elton. I listened to the entire album. Then I listened to it again. And again. Then I just went for broke and sang along, thanks to the geniuses who put the lyrics inside the album along with very colorful art. Before the end of the week, I could sing every single song on that double album. No, I had not the slightest idea what most of the songs meant, and neither did my parents. But I had my favorite songs anyway. Like Grey Seal. It had a terrific start, with Elton just whaling on his keyboards like he was having the time of his life. I would try to imitate the rolling wave of the music, but I never got the hang of air-piano. So I just sang. That only see what's real? Now...what the heck is a grey seal? The picture in the album was a phoenix bird, but that didn't seem to go with the song. My little brain was puzzled. I even consulted an encyclopedia, only to find weird pictures of actual seals. Why would Elton be singing about an elephant seal? Also, seals don't talk, so how would anyone know that they are wise? I asked my dad. What the heck was I doing singing this ridiculous song, he wanted to know, when the lyrics made no sense? He recommended that I listen to more Conway Twitty. Which, in the timeless tradition of teenagers and rock and roll, made me love Grey Seal even more. I still have no idea what the song is about, but now that I am an adult, I realize that Bernie Taupin, the guy who wrote all the lyrics for the album, was likely stoned out of his gourd when he wrote Grey Seal. All the musicians were stoned in the seventies. Stoned people don't necessarily think deep thoughts about what they are writing. Hence songs like Grey Seal. Ultimately, it really doesn't matter if the song lyrics make sense. What matters is how it makes you feel. That song made me happy. 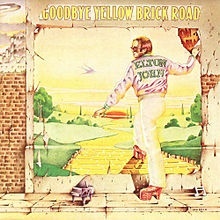 I still love the song, and Goodbye Yellow Brick Road is still one of my favorite albums. Mamakat's prompt: 3.) But it’s got a great beat! Tell us about a song you loved growing up even though the lyrics were ridiculous. Well, at least giving up the Osmonds for Elton John makes sense, even if the lyrics don't. I've always been confused by 'riding in the desert on a horse with no name ...' but maybe 'drugs' is the answer to all these questions!! Fortunately or unfortunately, drugs are the muse that often inspires many a catchy tune! This album was brought to you by the same influences that brought us a Purple Haze, Dark Side of the Moon, Light My Fire, and Kashmir (to name a few). Straight trippin'! Oh yes! Lots of good music came out during the seventies, mostly inspired by some drug or another. I love the song "Across the Universe" even though I know it was assuredly influenced by LSD. It is beautiful and I don't care. Judging by the songs on the radio, they all seem to be nymphos. And yet, teen pregnancy is down...maybe they put all that sexual angst into the music instead? Weren't the 70s grand? And yes, it was GENIUS that record companies started putting lyrics in the liner notes. Kept us from having to lift up the arm of the record player over and over while we madly wrote lyrics down on a sheet of notebook paper. Although sometimes I read those liner notes, and it doesn't sound at all like what they are singing. Enunciate, people! As long as I can dance to it, I'm good! Agreed. Doesn't much matter what Elton is doing, it sounds awesome.